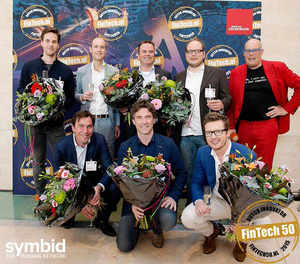 Symbid, an online funding platform for start-ups and small businesses, yesterday received the Dutch FinTech Award for SME Finance following the launch of The Funding Network™ in March 2015. Over 100 companies have been funded via The Funding Network™ in less than 2 months for a total of $68.5 million. This award is recognition of Symbid's commitment to simplifying the way small businesses are funded through innovative financial technology. "We're delighted to receive this award a few weeks after launching The Funding Network™. Our efforts in combining traditional and alternative finance in one online platform are really a means to an end. That end is a more efficient, transparent capital market for investors and entrepreneurs," said Korstiaan Zandvliet, co-founder and CEO of Symbid Corp. "With 50 institutional and over 30,000 private investors already connected to The Funding Network™, we at Symbid are excited about our potential for helping to democratize finance." Founded in April 2011 as one of the first investment crowdfunding platforms worldwide, Symbid is The Funding Network™, where companies get funded and grow. As a leading online funding portal for small- and medium-sized enterprises, Symbid (www.symbid.com) gives entrepreneurs direct access to traditional and alternative forms of finance, while offering investors full transparency on the potential risks and returns of their portfolio. Advanced investing, monitoring and data tools ensure companies connecting to The Funding Network™ are financed in the most efficient way possible. Built around cutting-edge technology and expert financial advice, The Funding Network™ by Symbid is the go-to platform for entrepreneurs in search of funding and investors in search of exciting opportunities. As of March 2015, The Funding Network™ has a monthly transaction volume of $40 million with the potential for generating future revenue streams. With 50 funding partners already connected -- including banks, venture capital, angel investors and 30,000 private (crowdfunding) investors -- the total transaction volume of The Funding Network™ in 2015 is estimated at $800 million. Symbid Corp. is a U.S. publicly listed company (OTCQB: SBID). For investor relations, please visit www.symbidcorp.com. About this company Symbid Corp.
Symbid collects the Dutch FinTech Award for SME Finance as one of the most innovative FinTech market players. The Funding Network by Symbid connects entrepreneurs to all types of finance, traditional and alternative.